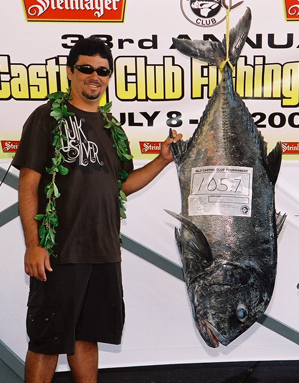 Robert Texeira was competing in the 33rd Annual Hilo Casting Club Tournament on the Ka'u Coast of the Big Island when he made his monumental catch. Robert was using a 12-foot 6-inch Slider pole, Newell G-454 reel and 80-lb test Maxima when he hooked this fish. He won second in the tournament.